It’s time for an ASUS VG245H review, a FreeSync monitor that is priced well for what you get. If you’re using an AMD card, you should consider picking this up. At 1080p resolution, FreeSync technology included, 75hz refresh rate and 1ms response time all at a very reasonable price – you really can’t ignore this one. The most important aspect to this monitor is the fact that it comes with AMD’s FreeSync technology. 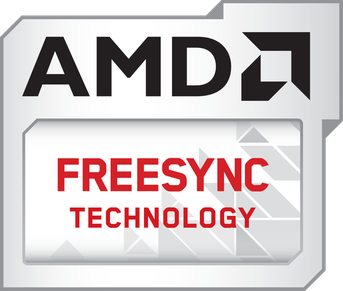 FreeSync is a synchronization technology that was made to reduce screen tearing at refresh rates that allow higher frames per second in a game. Most 1080p monitors that are under $150 have a 60hz refresh rate along with a low response time to allow for 60 FPS with no input lag. Response time is the amount of time it takes for the monitor to show whatever action you’re inputting whether it’s the click of a key or clicking a mouse button. If you try to go past 60hz without a technology like FreeSync then you’d run into noticeable screen tearing. The V-Sync setting in most games get rid of screen tearing but it can’t do all of the work past that. Since this monitor has a refresh rate of 75hz then it’s able to display a max of 75 FPS in-game. It’s thanks to FreeSync that it’s able to effectively display it. It’s a 24-inch monitor which is a decent size, there is also a 27-inch model and other versions that can go up to 144hz. The thing with FreeSync is that it’s only useful if you’re using a compatible AMD video card. If you’re using anything from NVIDIA then you aren’t going to be able to use FreeSync, NVIDIA uses a similar technology called G-Sync with other monitors. If you’re using anything past the R9 285 then you’ll be able to utilize FreeSync. It makes sense that only some of the newer cards on the market are able to use it because it’ll drive more sales for the video cards and the brand overall. If you aren’t using an AMD video card then you’d be better off going with a monitor that has G-Sync or just a different monitor in general. 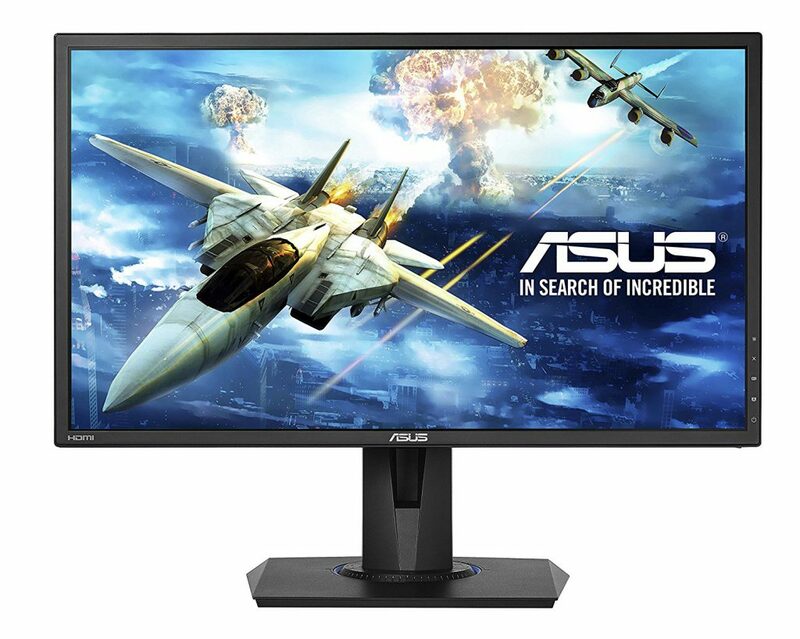 The Asus VS228H is another great monitor from ASUS which I’d recommend if you’re wanting something cheaper or if you’re not able to use FreeSync. 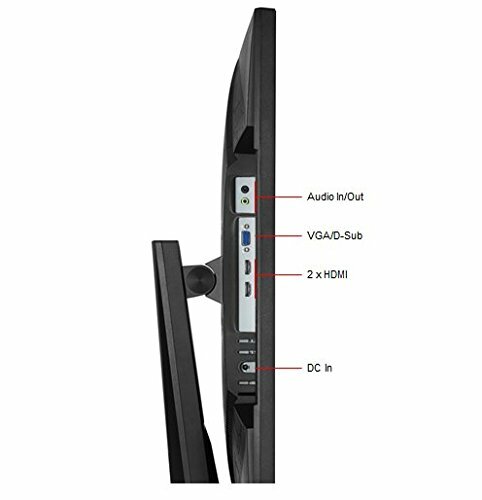 ASUS does a lot when it comes to making sure that the technology behind one of their products, especially a monitor, is up to par with what should be expected when getting a nice monitor like this. GameFast Input Technology was made to give a much faster delivery from an input to the actual action on-screen. 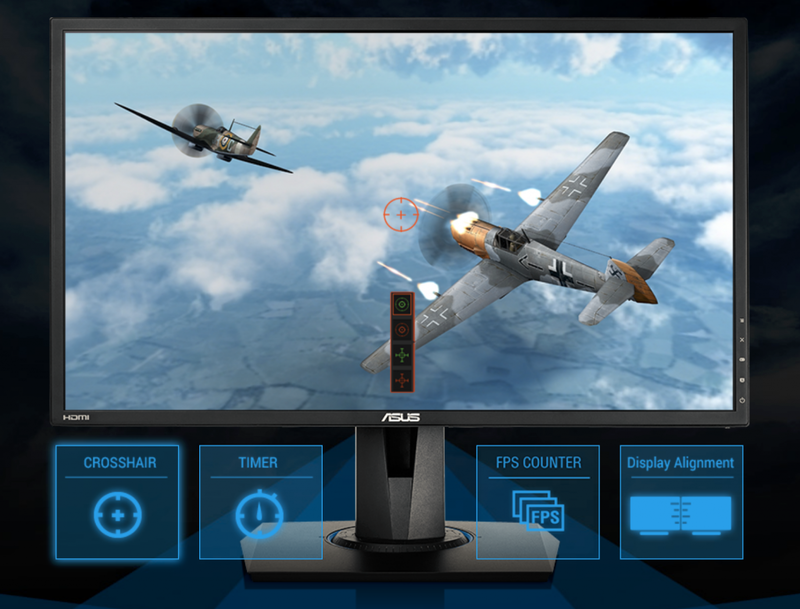 ASUS knows that at a competitive level, each millisecond counts. With this technology, there is a focus there where input lag seems non-existent. GamePlus and GameVisual technology is exclusive to ASUS and gives certain levels of contrast, saturation and brightness depending on which setting you pick. There are different settings for different types of games such as FPS, racing or RTS/RPG. There are also other setting to help with your aim and such, geared towards helping out the overall gaming experience. ASUS EyeCare gives you four different blue light filters to use to reduce eye strain. For some, blue light from screens can cause headaches and straining to the eyes so having different filter settings allows you to experiment and see what works best for you. Along with EyeCare is also the Flicker-Free Technology which helps with eye fatigue since it uses dynamic backlight adjustment to stray away from low brightness levels which results to high-speed flickering. That’s what causes most eye fatigue. Having all of the features packed within the monitor is just another great selling point. Not only do you get the latest FreeSync technology but you also get a bunch of other bonuses which help to enhance everything as a whole. There aren’t a ton of monitors on the market right now, at this price point, that offer the amount of features that the VG245H model offers. For me the actual performance of a monitor is what is most important but the design is also something to consider before coming to a final decision of picking it up. The interface, buttons, sturdiness and the ports – these are all factors of design to also take a look into. For the interface it’s actually pretty easy to navigate around the settings and features. You simply open up the menu from the menu button and go from there. From the menu you can go through all of the features mentioned above as well as being able to change other settings which should be included with any screen really. Brightness, color temperature, skin tone… everything can be adjusted easily. There are 5 different buttons to use when navigating the menu and then some. The first two buttons from the top are what you use to navigate up and down after hitting the menu button. Then there are two hotkeys for GameVisual and GamePlus and then the obvious last button is the power button. This monitor is actually pretty sturdy and for good reason, you’re able to rotate/move the screen around freely. This makes sturdiness an obligation since moving a screen around shouldn’t be done when it comes to sturdiness. It also doesn’t shake a whole lot while using it because of this. The ports include two HDMI ports, a VGA/D-Sub, audio in/out and a DC in port for the power. Having two HDMI ports is nice because you could have a console and a PC using the same screen and you won’t have to switch out any cables, it’s a simple input switch away. I was actually kind of surprised to see a VGA port included with the monitor, I feel like most have moved onto using HDMI since it’s the norm but I suppose it doesn’t hurt anything to have it included. All in all, being able to move the screen up/down and being able to rotate/tilt it however you like it awesome. Having two HDMI ports and an easy interface to navigate through the different features and settings makes the experience that much better. If you’re looking for something that is under $200 while still providing top-of-the-line input lag prevention then this would be a top choice to consider. It’s packed with a bunch of features, it’s built to last for the long haul and had high quality in mind when it was made. There are also other versions of the monitor that include 144hz and a 27-inch size if that interests you more. I also recommend checking out the reviews over at Amazon if you’re really looking into it, it’s one of the highest rated monitors I’ve seen there! So, what are your favorite features of the VG245H model? Are you going to be picking this up? Tagged 1080p gaming monitor, amd, asus, freesync. Bookmark the permalink. While I grew up in the video game era, I am nit up on todays high tech gadgets. My son wants a new gaming monitor for Christmas. To tell the truth I am all for it if it gets him off of my TV! Is the ASUS VG245H good for gaming consoles or is it just for computers? Also what effects or technologies does it have to help protect his vision? Hey Brendon! Yeah it’d be great for console use as well, there is ASUS EyeCare which will help with some of the eye strain and what not that could happen from looking at a screen for too long. The only thing I see is that the FreeSync technology won’t be able to be used on a console but consoles aren’t able to utilize the higher FPS rate anyway so if you’re looking for vision protection built in then this monitor would be ideal! Great review on this monitor! I’ve always wanted to upgrade my laptop to a gaming computer, but I don’t know where to start. The Asus VG245H seems like a good candidate to my future computer. I play Grand Theft Auto 5, do you think the resolution would handle that game? For GTA V it depends on the specs of the PC, though with how components are today GTA V is going to run well at 1080p on almost any build. Was kind of upset that freesync will only work with an AMD video card because I am a big fan of Nvidia graphics cards which would be most likely turn me away from this monitor but for someone with a AMD this would make a great gaming monitor at a good price. You mentioned that “NVIDIA uses a similar technology called G-Sync with other monitors.” Know of any off the top of your head? A popular one is the Dell S2417DG monitor – it’s a 1440p monitor with G-Sync, almost a “go-to” for those looking at getting G-Sync without completely breaking the bank.